The GDPR deadline is on its way, but what about Brexit? You may have heard the term GDPR banded about in the media quite a lot in recent months, but do you know what it is and how it applies to your business? Over a series of blogs – which kicked off last week – we’ll be helping you understand your new responsibilities under the General Data Protection Regulation (GDPR). This week we’re joining the dots between the GDPR and the elephant in the room that is Brexit. In case you missed the world altering referendum in June 2016, the UK has voted to leave the European Union and on 29th March 2017, Prime Minister Theresa May triggered Article 50 to signal the start of Brexit negotiations. Despite the impending separation of the UK from the European Union (EU) and the distinctly EU nature of the GDPR, it remains imperative that UK businesses work towards GDPR compliance ahead of the deadline on 25th May 2018. The GDPR introduces a lot of changes to the responsibilities of both data controllers (anyone who collects and uses data,) and data processors (anyone who stores data,) and it’s important that you start to understand what your business needs to do to become compliant before it’s too late. 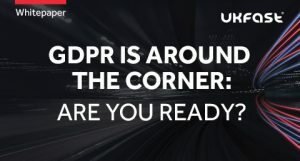 To find out more about why the GDPR has come about, what it means to your organisation and to kick-start your GDPR compliance journey, download our new whitepaper – GDPR is around the corner: Are you ready?